We are a small and closely knit Christian organisation and our primary objective is to raise awareness. Please email or call us if you would like to know more about us and/or get involved in any way. We have a child sponsorship scheme in place as well as opportunities to join a prayer cell with regular updates from Sri Lanka. Other activities such as personal and corporate sponsorship events have been run in the past in partnership with CAVALS and Footprints. We have been blessed in having visitors and working holiday groups to our organizations in Sri Lanka also. “When we first walked into Footprints Children’s Home, it was like walking onto a different planet, let alone it already being a different country. All your doubts and questions, troubles and worries are left at the front door when you are greeted by the excitable and happy little children. I wish I had more hands so that these cute faces didn’t have to take it in turns, – clinging to me like a baby’s hand to a mothers finger. The atmosphere of the children’s home was warm, homely and welcoming, a feeling of family and acceptance. Once I got to know the children individually, I realised that each child was unique, their story, their personality, and their relationship. But one thing all these little angels had in common was that they were happily content in the love of Jesus. “The moment I walked through the door at Footprints I felt like I had gained thirty-three more sisters. Since then we have played together, prayed together, eaten together and spent over six weeks living together. These girls bring me such joy and it is a privilege to be here with them. The children are happy and loving and continue to show me so much love. They are encouraged to reach their full potential in their studies and nurtured in their relationship with God with an important emphasis on prayer. “I’m in the process of doing my A levels and before I start my degree, I wanted to go and help/teach in a foreign country. My family have known about the amazing work that Footprints and CAVALS have done for a number of years, so I spoke to them about coming out to help in the school and with the children in the homes. 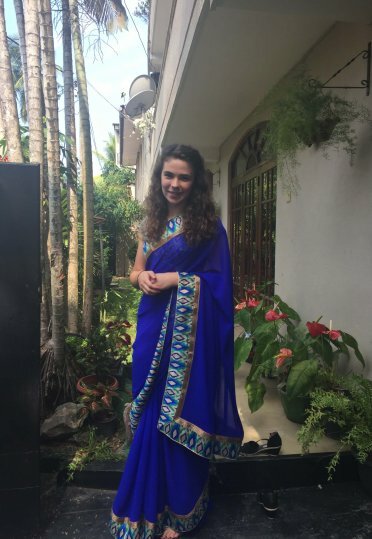 “I had the privilege of spending 6 months in Sri Lanka from January to July 2017 teaching in Alpha School and living with the girls at ‘Salam Villa’. The time I spent there was so much more rich and meaningful than I could have possibly imagined. The vibrant Sir Lankan culture was very different to anything that I had experienced before but I grew to love it and as I started to settle in the more I embraced it and appreciated all the wonderful aspects of my life there – the food, the routine, the people. My home was with the girls – a place full of joy, noise, and special people! Meeting the girls and living with them was truly the highlight of my time. The love that they showed to me and to one another was so inspiring. From the moment I stepped through the door I felt like I had gained over thirty more sisters! We ate together, sang together, played together and laughed together. They became my family and I will forever have a special place in my heart for each and every one of them. During the week I would teach at the school. I was responsible for the Grade 1’s and what an experience that was. I loved it! Don’t get me wrong, it had its challenges as we went from little or no English to reading and writing and speaking! I had seven precious little ones in my class and I loved having the privilege of being able to teach them. Each day was filled with fun as we learnt through singing, playing and reading. The whole class made great progress and now as they progress onto the next chapter of their learning in Alpha School I have no doubt that they will excel. The diligence of the teachers and staff at Alpha School was inspiring. The vision that the school has to provide an English education to those that wouldn’t be able to afford it is so important. They continue to impact and change those children’s lives every day and I cannot wait to see what the future holds for this wonderful school! Before I knew it, the six months had come to an end and it was time to return to the UK. I was so torn to leave the friends and people I had grown to love. I had been so welcomed and embraced and I now felt my home was with them. Sri Lanka captured my heart and its people will forever have a piece of it. It is truly a beautiful place, not only because of the vibrance, but because of the people. I’m so thankful to God for all the wonderful people that I can count as friends. More so, I am thankful to have seen His hand at work using His children for His glory and bringing joy, purpose and meaning to people’s lives. 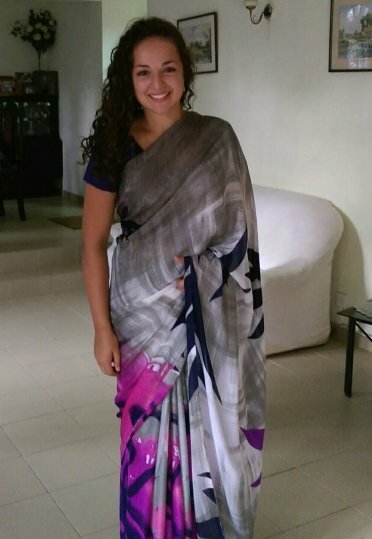 I went to Sri Lanka as a visitor, but came back an akki (big sister), friend, and teacher. I’m so grateful for the opportunity I had to spend some time there, to see God at work, using His children to faithfully share His Gospel and love. “It has been 12 years since I have been to Sri Lanka, and being only 17, I was very nervous on my journey to ‘Salem Villa’; however, all my worries and nerves vanished when I was greeted by lots of ‘Becky Akki’s’, cuddles and kisses. My family and I have known about the amazing work that Footprints and CAVALS does, but going to see and be part of the work is truly a life-changing experience! This trip was particularly eye-opening because of the challenges that I had to face in the early years of my life and being in Sri Lanka among so many inspiring children showed me just how beautiful God’s plan is for my life. I gained 21 little sisters, 14 little brothers and 13 big sisters (which was an amazing experience after being an only child in England). I was surrounded by so many inspirational people, who have taught me that trusting God, and working hard enables you to achieve anything! It was lovely waking up to see the children’s smiling faces, waiting to go to church to learn new things about God and the excitement of going to school to broaden their learning. Teaching at the Alpha School was also a valuable experience, as I begin my degree in Primary School teaching in September. This experience has made me confident that this is the vocation for me and seeing the children progress greatly in one month has made me a happy teacher! The children are cared for extremely well, and it’s the happiest place I have ever been to! Everyone is smiling and they have a strong hope for the future, and for the things that God has in store for them because of the work of those at Footprints and CAVALS. “After the amazing 1 month I spent in Sri Lanka last year, I knew that I had to go back, and I am so glad I did! It felt like I was coming back to my family, and the children gave me the best welcome home ever! During the 3 months that I stayed with the children it was lovely to see how much they had grown from last year in their walk with God, in their school work and with each other. In particular I was amazed at how much the Alpha School has grown! In 1 year, the number of children has increased, and the children’s learning has grown too. The children are very much engaged in their learning, and as a trainee primary school teacher it was amazing to see how the school is helping all of the children to develop in their learning of English as a second language. I was able to take part in a range of school activities such as the Alpha School Bible Week, Parents meetings and I was able to teach year 4 how to play the recorder. “Considering the background of these children, we were amazed to see how full of smiles they were, and how positive they were about their school work and towards each other. When we first arrived we were greeted by a multitude of happy children, who affectionately held our hands and clung to our arms, calling us “Akki”. They showed us their beautifully decorated dormitories with pride, before teaching us some traditional Sri Lankan games. Teaching the younger children Maths, English, Science, Computer Studies, Religion and Environmental Studies was a fantastic experience from which we’ve both gained a huge amount, even if, at times, it was challenging to keep some of the children in their seats. Now we find it much easier to sympathise with our teachers! The resident staff, teachers, and children were all enormously helpful, and made us feel very welcome. We also had great fun painting the front wall of the school, and the children loved their new mural. We also had an art afternoon, where the children used the new watercolours we gave them to do some finger painting.